Crochet braids and Crochet Senegalese Twists! Crochet braids and Crochet Senegalese Twists are so fun and simple to wear as a protective natural hair style. Crochet braid styles are the new wave of protective hair styles in the natural hair, transitioning hair and relaxed hair community. So why are crochet braids so popular? It is because crochet braid styles come in such an assortment of color, sizes and textures of different types of crochet hair. So far I have tried the Crochet Senegalese Twists hairstyle and the loose crochet braids or crochet weave hairstyle made from kanekalon hair. Want to learn more about my Crochet Senegalese Twists? Check out this video below. I go into details regarding my Crochet Senegalese Twists and Crochet braids routine. I also answer questions related to: Does crochet braids grow your hair? 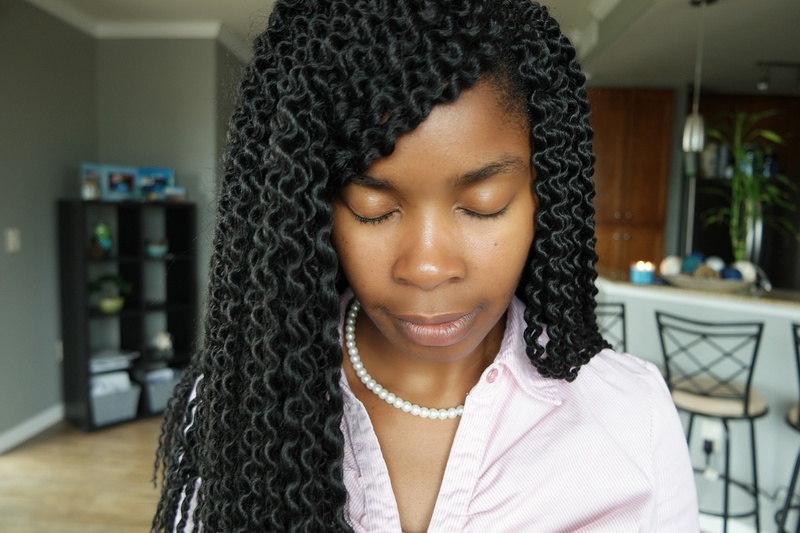 How long do crochet braids last? How many packs of hair for crochet braids? Do crochet braids damage hair? In my natural hair journey, I have discovered that there can be some limitations with 4c natural hairstyles due to my 4c hair texture and natural hair routine. I have the kinkiest type of natural hair which is the 4c hair texture. When you combine this hair texture with my routine of needing to keep my hair moist as well as clean, it can be a real hassle to keep hairstyles neat. Therefore in the second go round of my natural hair journey, I am focusing on protective natural hairstyles that allow me to have the freedom to wash my hair and moisturize my hair as often as I would like without jeopardizing the natural hair style or my natural hair routine. Right now that focus is on that of wearing crochet braids, crochet senegalese twists, and wigs. These two styling options last longer, meaning I can leave my hair alone longer, as well as look good even months after the installation of the hairstyle. This method has allowed my hair to grow thicker and faster than if I was not protecting my hair. Crochet braids are different than regular braids due to you cornrowing your own hair first then crocheting the hair into the cornrow. When I add hair during the process of cornrowing, that helps make a stronger and a more lasting base. So wash after wash, my hair stays in place. With regular braids, my hair normally starts to frizz or peek out of the braid as soon as I add leave in spray and most definitely after the first wash. Since all of my hair is braided into the cornrow, none of it can peek out of the actual crochet braid or crochet Senegalese twist. Then once my base starts to get frizzier, I can hide my hair by pulling and moving the crochet hair to cover up the unsightly parts of my hair. I call this a win, win, win! Have you ever tried crochet braids? What are your thoughts about them?